Ashford Brothers & Co. Artist associated with 14 portraits. Duroni & Murer (active 1860s). Artist associated with 5 portraits. Horatio Nelson King (1828-1905), Photographer, dealer and stationer. Artist associated with 53 portraits. Frederick Holland Mares, Photographer. Artist associated with 4 portraits. James Mudd (1821-1906). Artist associated with 12 portraits. Unknown photographers. Artist associated with 13 portraits. (George) Herbert Watkins (1828-1916), Photographer. 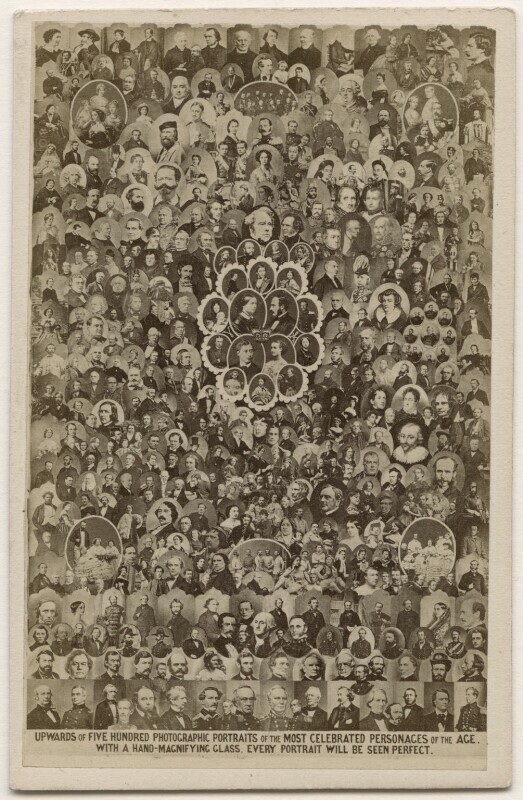 Artist associated with 262 portraits, Sitter in 1 portrait. John & Charles Watkins (active 1865-1870). Artist associated with 333 portraits. Princess Augusta Wilhelmina Louisa, Duchess of Cambridge (1797-1889), Wife of Prince Adolphus Frederick, 1st Duke of Cambridge. Sitter associated with 20 portraits. Benjamin Disraeli, Earl of Beaconsfield (1804-1881), Prime Minister and novelist. Sitter associated with 110 portraits. Charles Blondin (1824-1897), Tightrope walker. Sitter in 4 portraits. Sir David Brewster (1781-1868), Natural philosopher and academic administrator. Sitter in 18 portraits. George Cruikshank (1792-1878), Caricaturist and illustrator. Sitter in 33 portraits, Artist associated with 26 portraits. Giovanni Matteo de Candia (Mario) (1810-1883), Italian tenor. Sitter in 16 portraits. Charles Dickens (1812-1870), Novelist. Sitter in 95 portraits. Maharaja Duleep Singh (1838-1893), Maharaja of Lahore. Sitter in 6 portraits. Elisabeth, Empress of Austria (1837-1898), Wife of Emperor Franz Joseph I of Austria. Sitter in 17 portraits. Victor Emmanuel II, King of Italy (1820-1878), Reigned 1849-78. Sitter in 7 portraits. Giuseppe Garibaldi (1807-1882), Italian soldier; played central role in unification of Italy. Sitter associated with 22 portraits. Sir George Grey (1812-1898), Colonial governor. Sitter in 6 portraits. Giulia Grisi (1810?-1869), Singer. Sitter in 24 portraits. Eleanora ('Ellen') Kean (née Tree) (1805-1880), Actress. Sitter associated with 19 portraits. Princess Victoria, Duchess of Kent and Strathearn (1786-1861), Mother of Queen Victoria. Sitter associated with 33 portraits. John Laird Mair Lawrence, 1st Baron Lawrence (1811-1879), Viceroy of India. Sitter in 24 portraits. David Livingstone (1813-1873), Missionary and explorer. Sitter in 40 portraits. Maria Alexandrovna, Empress of Russia (1824-1880), Wife of Alexander II, Emperor of Russia. Sitter in 4 portraits. Princess Mary Adelaide, Duchess of Teck (1833-1897), Philanthropist; mother of Queen Mary. Sitter in 44 portraits. Charles James Mathews (1803-1878), Actor and dramatist; son of Charles Mathews. Sitter in 27 portraits. Florence Nightingale (1820-1910), Reformer of hospital nursing and of the Army Medical Services. Sitter associated with 36 portraits. Pope Pius IX (Giovanni Maria Mastai-Ferretti) (1792-1878), Pope 1846-78. Sitter in 6 portraits. Albert Richard Smith (1816-1860), Writer, public lecturer and mountaineer. Sitter in 15 portraits. Archibald Campbell Tait (1811-1882), Archbishop of Canterbury. Sitter in 36 portraits. Alfred Tennyson, 1st Baron Tennyson (1809-1892), Poet Laureate. Sitter in 96 portraits. George Washington (1732-1799), First President of the USA. Sitter in 22 portraits. Samuel Wilberforce (1805-1873), Bishop of Oxford and of Winchester; son of William Wilberforce. Sitter in 84 portraits. Nicholas Patrick Stephen Wiseman (1802-1865), Cardinal-Archbishop of Westminster. Sitter in 16 portraits.